WiFi used to be fairly expensive to add to MCU projects with spending $30 to $40 just for a WiFi module pretty common just less than 5 years ago, but this all changed thanks to Tensilica based Espressif ESP8266 modules selling for $5 in 2014, and an active community gathering behind the WiSoC, and related modules and development board. ESP8266 modules are now available for under $2, and around two years ago it looked like we would have another option based on Arm Cortex-M3 with RTL8710 modules such as Pine64’s PADI IoT stamp also selling for about $2 in single quantities. However, most people did not really the benefit of switching to another platform based on Arm for this type of applications, and the products never really took off, many went away, and PADI IoT stamp appears to be one of the few survivors. Yet another $2 WiFi IoT module has appeared on Seeed Studio with Air602 WiFi module powered by Winner Micro W600 Arm Cortex-M3 WiSoC. The module is programmable using AT command and/or Luat programming language combining Lua and AT commands. The module is really small, as for reference the popular ESP-01 module measures 24.8 x 14.3 mm, or nearly three times as big as Air602! The trick to achieve this ultra-small size is to NOT include an antenna at all, instead exposing the antenna pin only. Winner Micro W600 block diagram also shows 160KB+128KB of RAM, crypto hardware acceleration, RTC, and other peripherals and interfaces. Getting started with the module only may not be the most convenient, since you’d have to take care of power and an antenna, but luckily you don’t really need to care at this stage since Seeed Studio offer an Air602 development board for $2.90 – including Air602 module – that connects over USB and takes care of those little details. I’m not convinced it brings much over ESP8266, and there would be a lot of work to bring software support up to the task, but maybe I’m missing sometimes, so we’ll have to see how things turns out. You may also find more details and some download links on WinnerMicro W600 product page (which did load slowly here). Thanks to PuceBaboon for the tip. Looks like an interesting chip and board. I’m not sure how much air there’s left in this part of the market. As you rightly point out the ESP8266 has all of this pretty much covered and has a very mature development environment and community. For hobbiest work, the ESP32 has taken all of the interest away from the ESP8266 even as it’s way more capable and easier to program. The incremental part cost isn’t as much of a factor in that market, but the maturity of the software tools and the support from Espressif and the community are worth it. It’s not clear to me the target market of cnx-soft, but I was under the impression it’s more of a hobbiest/end user rather than “in the industry”, but that could be me projecting. 🙂 The latter might find a use for this chip as they may have some unsuspected requirements or limitations. Good catch, cnxsoft, thanks for the article. Don’t forget WICED that is also arm based. I switched completely to ESP32 and Micropython. Python may have a large overhead, but software development is ways faster and easier than with Arduino/Platformio or the native SDK. And it’s fast enough for everything I want to do with it. This is also what I noticed at SHA2017, where the esp32 badge had micropython by default. People were so quick to make software for it. If it really has 1MB of flash, the interesting part would be to know how much of that is available once the Wi-Fi stack etc. is loaded. Also, designing your own Wi-Fi antenna is not exactly easy, at least not to make something with decent range. Obviously this can’t be used in retail products without certification either, since the certification has to include the antenna. Looks like an interesting piece of hardware otherwise. I can see this ending up in some low-end Wi-Fi based IoT products. It’s quite straightforward how to setup/build the toolchain for ESP32. Haha, sure sure, just building the toolchain with magic scripts and then running a make file someone give you is easy – but just try to look into what build-esp32-toolchain.sh is doing or how the Makefiles are setup. It’s horrifying. (and I’m guessing that’s why you’re putting the insanity in a container) I’m not really talking about that. It’s got a few small warts, but you literally run: git clone -> cmake -> make- > openocd and you have code running on your board! You can open it into any modern IDE (or Emacs) and have full code completion, debugging, linting and jumping around library code. This is like a whole ‘nother level man.. Sounds like you need to give PlatformIO a tryout on the ESP platforms. Much more together than the Espressif toolchain and not nearly as clunky as the Arduino stuff. You just need to remember to run “pio run” instead of “make” (yes, my fingers still occasionally type the wrong incantation, even after a couple of years …I really should put a Makefile in my build directories 🙂 ). Let’s petition the GCC developers to actually support other arch with a toggle switch, like LLVM is doing with –arch=armv7. Most distros do not ship binary cross compilers, for ARM it got better recently with the armv7 android mass adoption, but for most other exotic arches, binary toolchains are not there yet. The RTL8370 was pretty nice hardware, the biggest problem was that the SDK is an absolute mess. Does this have a proper c++ sdk?, or mbed support? Could only find it on Taobao for few cents at the moment… But gonna try to get some, just to breadboard them. Can you confirm the linux ch340 driver works fine with the wch330? lsusb? dmesg? lsub -vvv? The USB ID and behavior of CH330 is the same with CH340. And I have used with ch341 kernel driver for a long time. Is there a similar board with USB? This USB is really interesting. Just print a a plastic case and use your software and you have a ready to use product. If you mean a similar ESP8266 board with a full size USB port, there was vESPrino project @ https://www.cnx-software.com/2016/08/01/vesprino-esp8266-usb-wifi-dongle-supports-add-on-boards-crowdfunding/, but it generated very little interest, and does not seem to be available anymore. 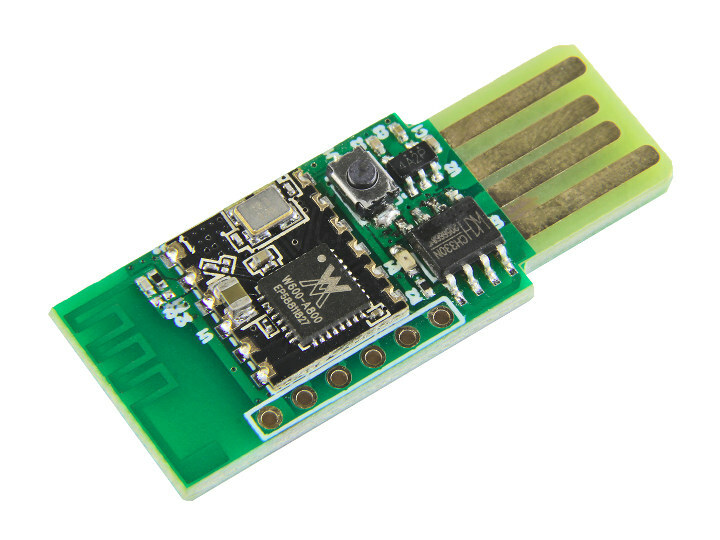 WiThumb is similar https://www.cnx-software.com/2016/07/01/withumb-is-an-esp8266-wifi-usb-adapter-with-motion-and-temperature-sensors-crowdfunding/, but also gone. They have ESP8266 USB adapters on Aliexpress (https://www.aliexpress.com/w/wholesale-adapter-esp8266.html), to be used with ESP-01. Mhmm, this form factor is way more interesting. Is it only flashing via USB or also other communication? That would be really interesting. is this a joke that you make a small PCB only to put it on another PCB? the specifications looks sub-standard for manufacturing. at 10 dBm output power, i believe it cannot make it to commercial use as a WiFi module. it is more like Bluetooth. Can 802.11b rates be disabled on this chip? How does it compare to rtl8710 ameba which is also $2 arm m3? It’s good for competition. This one runs on ARM so it might be quit appealing to those who don’t trust ESP’s Xtensa toolchain. The fact that Seeed makes it like a USB stick might cater to audience who love to stay light. I mean, no cable and stuff. I don’t see any added value in Air602 module over PADI IoT Stamp (RTL8710). RDA5981 had a chance, but the manufacturer is not interested in supporting hobby segment, anyway RDA5981 has ARM Cortex-M4, Supports XIP – Execute in Place and USB2.0 peripheral. 2/ Missing XIP (Execute in Place), not sure whether it’s a limitation of being Cortex-M3, whether M3 core design simply does not support that. 3/ No ADC port – At least one ADC! expose some internal ADC interleaved as ESP does, but at least something. 5/ Nice to have to be able to succeed against ESP8266/ESP32 – USB peripheral (host as well as slave). P.S. There is an Mbed OS Patch that makes Target = PADI (RTL8710) compatible.